For branding or protecting videos from stolen, it would be better to add watermarks to your videos. The following article is the detailed guide on how to add watermarks to a video on Mac (macOS 10.14 Mojave included) using iSkysoft Video Converter Ultimate. Check here to learn more. At first, please import your videos to the video converter for Mac with drag-and-drop method or use the "Add Files" button to import videos from your Mac, mobile devices or camcorder. After loading your video, click the second or third icon under the video to open the editing window. In the Watermark tab, choose what type of watermark you want, and then input text or load local image. You can adjust the watermark transparency to suit your needs. 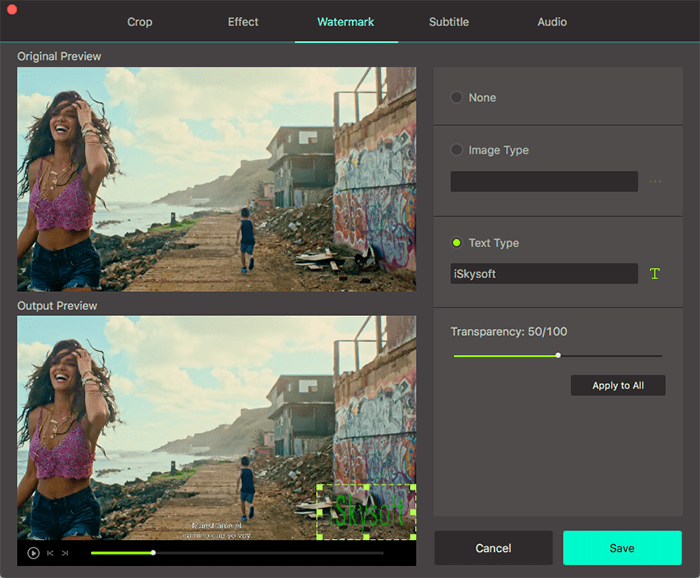 After adding watermarks to your video, you can also edit it with other tools on the program. Then set the output format and folder for the edited video. Finally, hit the “Convert” or "Convert All" button to save your video with watermarks.